I have another recipe for your holiday cookie tray today — classic meringue cookies! 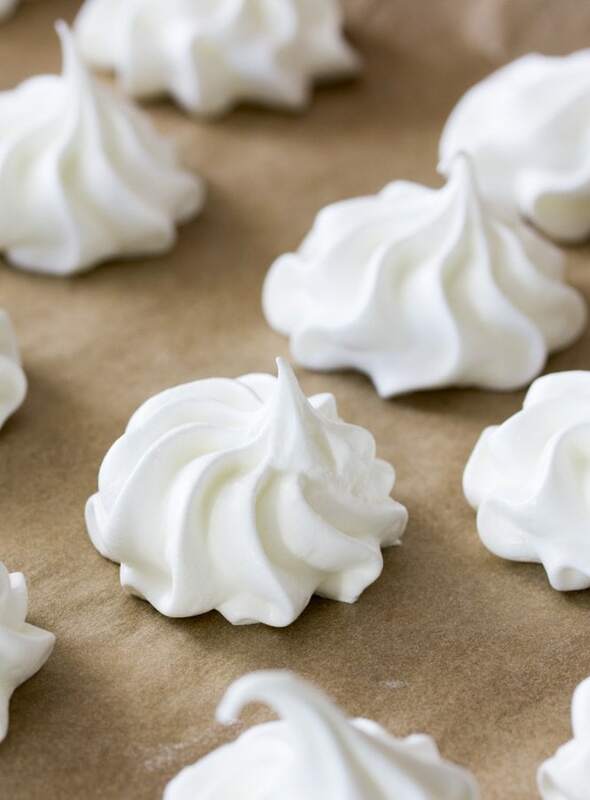 Meringues only require 5 ingredients to make, but they can be a little bit finicky — even the weather can affect them (winter is a great time to try them out, as you’re much less likely to have a very humid day this time of year!). I’ve been making this recipe over and over again the past few months to make sure that I understood all of the ins and outs of making perfect meringue cookies, and I’m finally ready to share what I’ve learned with you, so that you too can make these addictive little meringue cookies. If you’ve never had one, meringues are light, airy cookies with crisp interiors. I’m sharing a classic vanilla meringue recipe today (with notes on how to add your own different flavors! ), and the taste always reminds me of marshmallow 😍. This recipe calls for four egg whites and a single cup of sugar. 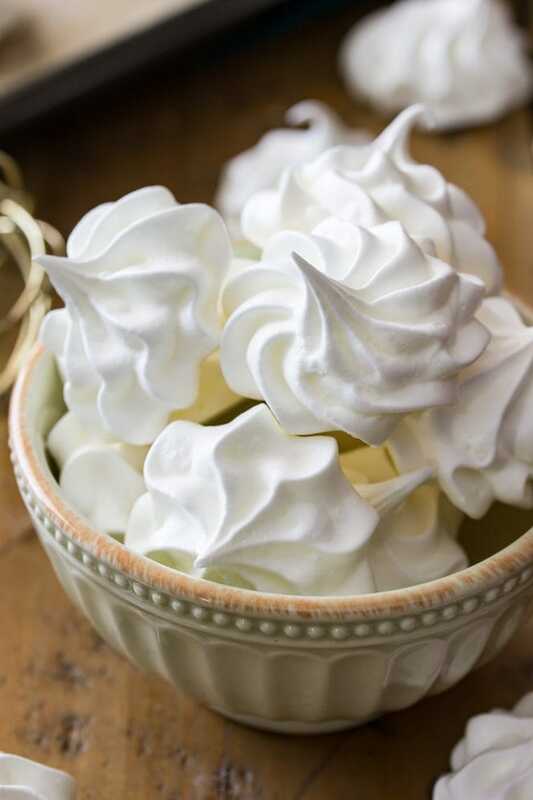 That may not seem like it’s going to yield you very many meringues when you start, but you’ll be surprised by how much these ingredients increase in volume. As you add the sugar, the mixture will become thick, glossy, and sticky, that’s exactly what you are looking for! You’ll also want the mixture to achieve stiff peaks — that’s how you’ll know that it’s done. If you’ve made my angel food cake or whipped cream before, then you’re already familiar with the concept of stiff peaks. It means that when you turn the batter over (like you can see in the image below with the meringue cookie batter), the peak that forms stands tall and does not fold back into itself. 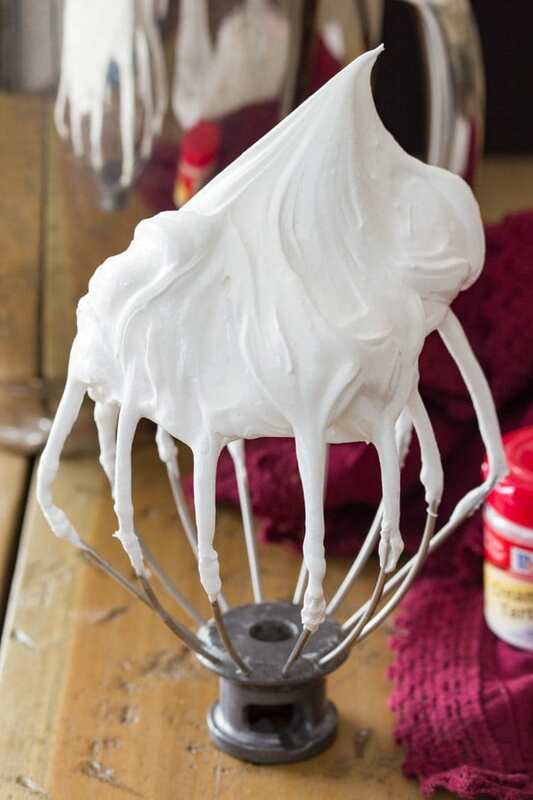 Make sure that the bowl and beater that you are using to beat your meringue is completely grease and moisture free. 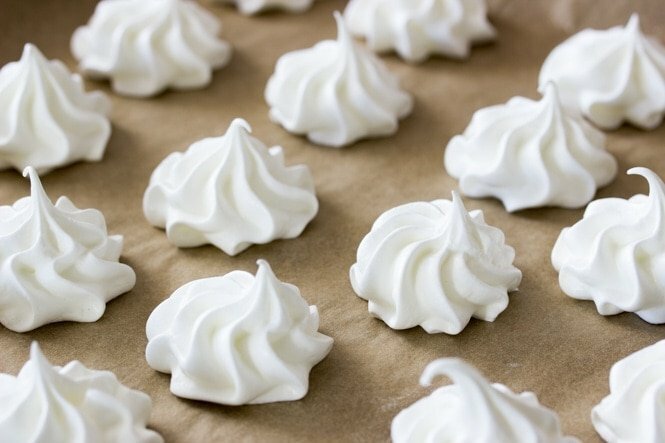 Any moisture can ruin your meringues. Crack your eggs in a separate bowl when separating the whites. 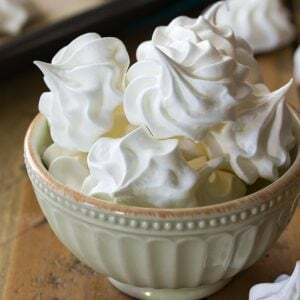 Even a tiny bit of yolk can also ruin your meringues, so crack each egg in a small bowl before adding it to the bowl that you will be mixing the meringue batter in. Add the sugar gradually, one Tablespoon at a time, and give it a chance to dissolve before adding more. You can test that the sugar is completely absorbed by taking a small bit of the batter and rubbing it between your fingers — if it’s not, it’ll feel gritty. Don’t stop until you get stiff peaks. The batter will take several minutes, at least, of beating to achieve stiff peaks, but keep going. It will increase in volume and be very thick and glossy — that’s what you’re looking for! Don’t over-beat your batter, either! Once you hit stiff peaks, stop! You can stir in your extract and any food coloring at this point, but don’t push it because over-beating the batter is just as bad as not beating it enough. If you’ve found that your meringues have gotten soft after you finished baking them, you can actually pop them back in the oven at 225F for another 10-20 minutes (watch them, if they begin to turn golden brown around the edges turn off the heat immediately) and then let them cool in the oven for another hour, this has always worked for me with meringues that start to get chewy. 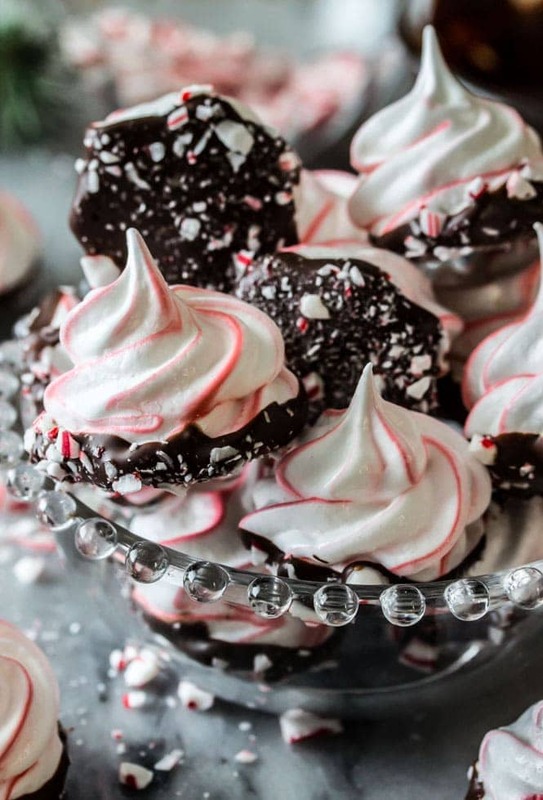 Once you get the hang of making meringues, feel free to play with lots of different flavors and colors — I made these Peppermint Bark Meringues by adding 1/4 teaspoon peppermint extract, striping the piping bag with red food coloring, and dipping the baked, cooled meringue cookies in dark chocolate and crushed peppermint pieces! Preheat oven to 225F (105C) and line a large cookie sheet (or two regular-sized cookie sheets -- make sure they will fit in your oven together) with parchment paper. Set aside. Combine egg whites, cream of tartar, and salt in a large, completely clean, completely grease-free bowl. Using an electric mixer or a stand mixer (with either the whisk or paddle attachment), stir on low speed until mixture becomes foamy. With mixer on high, gradually add sugar, about 1 Tablespoon at a time, stirring after each addition until sugar is dissolved (about 15-20 seconds between each addition). Beat until mixture is thick, shiny, and has increased in volume. Mixture should have stiff peaks and sugar should be completely dissolved (you can test this by rubbing a small bit of the mixture between your fingers, if it feels gritty, the sugar isn't dissolved). Stir in vanilla extract and any other extract you may like to use. If using food coloring, add the food coloring at this stage, too. 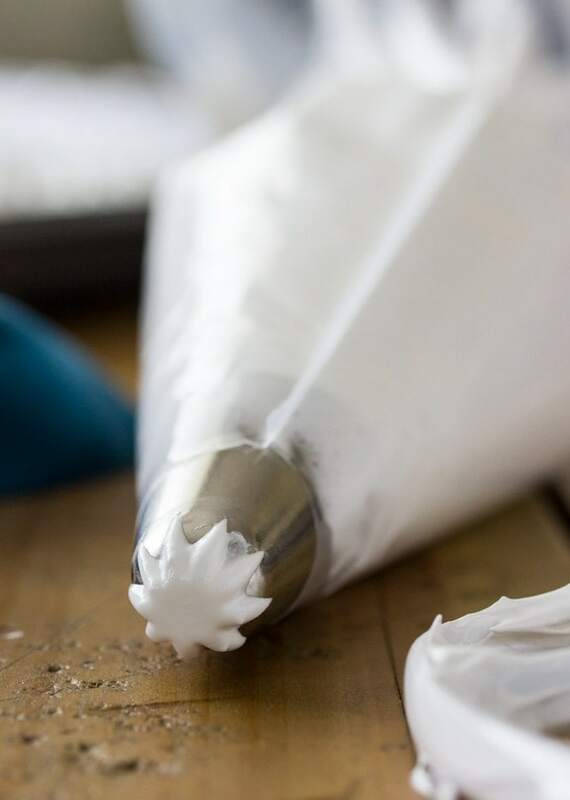 Fit a large disposable piping bag with a large tip (I used Ateco 846, but any large star tip will work or you can just snip the edge of the piping bag for a “kiss” formation) and transfer meringue to prepared piping bag and pipe onto prepared cookie sheet. The meringue cookies can be pretty close to each other as they won’t spread, and you will want to bake all of the cookies at the same time, so make sure you make enough space. Bake on 225F (105C) for 1 hour. Turn off the oven once the baking time has passed, and do not open the oven. Leave the oven door closed and allow cookies to cool completely in the oven (1-2 hours) before removing. Meringue cookies should be crisp and can be stored in an airtight container. Keep away from heat and moisture as it can soften your meringues. *You may substitute different extracts, if I'm adding a different flavor I usually like to still keep the vanilla but cut it down to 1/2 teaspoon, then add 1/4-1/2 teaspoon of the extract of choice. Be careful as some extracts (like Peppermint) are very strong, and you don't want to use too much! I thought I didn’t really like meringue cookies, but I was wrong! I was baking for a function that I was attending and I had a lot of egg whites left that I didn’t want to waste. I found this recipe and figured, what the heck, somebody at the party will eat them. I added lemon extract and yellow food coloring. They were so cute and delicious. Thanks for the recipe! I absolutely love these cookies! This was my first time making meringue cookies (and using a piping bag). I tested out the recipe a few weeks ago and made just vanilla ones and they turned out perfect! I plan on making lemon and orange ones for Easter this weekend for my fiance’s family. Great job and pictures! Thank you for sharing the valuable tips.